There are rebellions that were and weren't intended to be part of Red Faction Guerilla, Volition and THQ's well-reviewed destroy-everything open-world game. Kotaku talked to the game's designers about the possibilities and politics of what they made. "I like an open world where it feels like stuff is going on around you," James Hague, Red Faction Guerilla's lead designer at development studio Volition told me in a phone interview earlier this week. 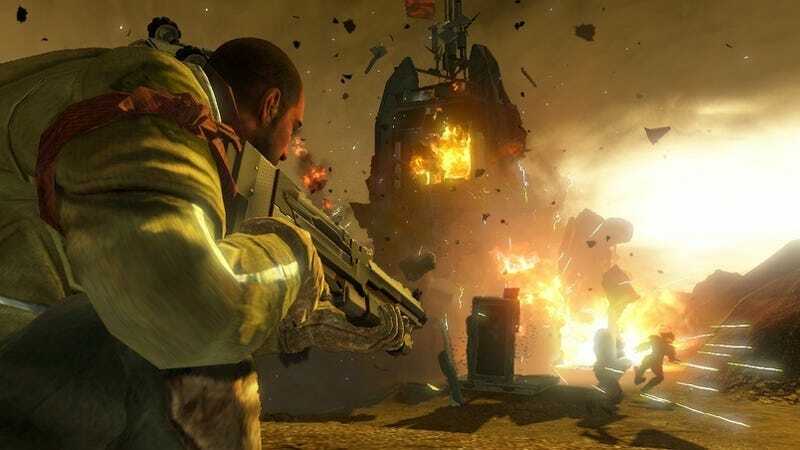 Red Faction Guerilla is a sprawling open-world action-adventure for PC, PS3 and Xbox 360 set on a Mars ruled under the tight grip of the heartless Earth Defense Force. The player is a miner-turned-revolutionary who shoots and batters enemies and buildings to help the just overthrow the bad. What Hague was discussing a game that is loaded with opportunity and charged with the energy of an insurgent's rebellion against a military authority – the kind that, not intentionally, has parallels to those seen fighting on the news these days. Let's start with the game design rebellion. The game Hague and his team made, the game that technical designer Luke Schneider maintains was not intended to be a "GTA on Mars," was made to feel like a more open open-world game than the average one. It was a game designed to enable rampant destruction and handle all of the gameplay consequences. Volition built their game, Hague and Schneider told Kotaku, on the premise that giving the player an axe and guns that can destroy every structure on the map is also a game that should open the player's options to do as much as they can imagine. "We wanted people to play pretty much however they wanted to," Hague said. There are signs of success. For example, the developers has learned that players are doing things the creators didn't expect. Take the destruction of a canyon-spanning bridge in the game's Badlands district. Some might take it down with explosives. Others might use the game's disintegration gun to zap one strut away at a time. Volition discovered that one player decided to attract military attention and then shot helicopters so they crashed into – and tore down – the bridge. Another player filled the bridge's lanes with cars then made them detonate in a chain. "When that was put in there, the goal was to put in something very large and allow the player a lot of choices in how to take it down. We're not looking to dictate how you do it." What they pushed was emergence, a value celebrated by players and makers of open-world games at least as far back as the launch of GTA III. "We were trying to go a little further out there in terms of emergent gameplay on the high level," Schneider said. During development, they went too far: "Players would just be completely lost." The developers said they wanted to make an open-world game that felt more open than gamers have been playing. Things in the world were just supposed to… happen. Convoys would drive through the game world at set times each game-day. Players could attack them or not. But some players of pre-release versions of the game panicked and felt that they'd be letting their guerilla movement down if they saw a convoy and didn't attack. Missions like hostage rescues that are now triggered only when a player goes to an icon on the game world's map – the classic way of starting missions in open-world games – used to instead be sprung upon the player as alerts they could choose to respond to. "We were trying to get a balance between letting you choose what you want to do and making the world seem alive," Hague said. "We tried at both extremes and I think the balance is pretty good." They found the right amount of insurgency to make their game work. And if it resembles any current real-life insurgency, that's not intended, the developers say. "We weren't looking at the modern day situation," Hague said. "We were looking at stuff like the past wars in Afghanistan and so on. How do react when you have a superior force against you and you can't attack them head on? We weren't trying to make an Iraq simulator." Yes, this is a game about being part of an insurgent fighting force, a game that rewards players who can sneak up and undermine a more powerful military maybe with a disintegration ray or maybe by blowing up a car in front of a building. But civilians are never targets. The enemy is only military and always armed. Early in the game, the hero of Red Faction tells his brother, "I'm not a terrorist," only to see his brother gunned down by the evil military rulers, the Earth Defense Force. "We didn't want people to feel like they were on the wrong side of this war," said Schneider, who said that wars as far back as the American Revolutionary War were studied for tactics. "We just wanted people to have fun blowing stuff up." With both the politics of the game as well as in the gameplay design, the developers don't think they took their rebellion too far. Almost. One mission, which puts the player in the turret position of a vehicle while a fellow freedom fighter sharpens knives and begins to viciously interrogate a captured military man, did make Hague briefly uneasy. "The first time I actually played that mission once we got it in place I felt kind of bad," he said. He remembered thinking: "The Red Faction really crossed the line here. I don't know if I believe in the same stuff they believe in anymore, but I've got to keep continuing because it's a good cause overall… I remember we were going to go with an interrogation fairly early on. It just wasn't until we did the final writing pass and recording pass that we could really hear it in context. Honestly, it came out a little more over-the-top and intense than I expected to be." A scene like that wouldn't have been unusual in 24 or out of context in an action movie. It's an ethical boundary, pushed. The rebellions of Red Faction Guerilla are set to continue. Development of downloadable content is underway. The two developers would not share specifics. Is this as open as it gets? Of course not. But as far as they've gone, the makers of Red Faction Guerilla are happy with the result.